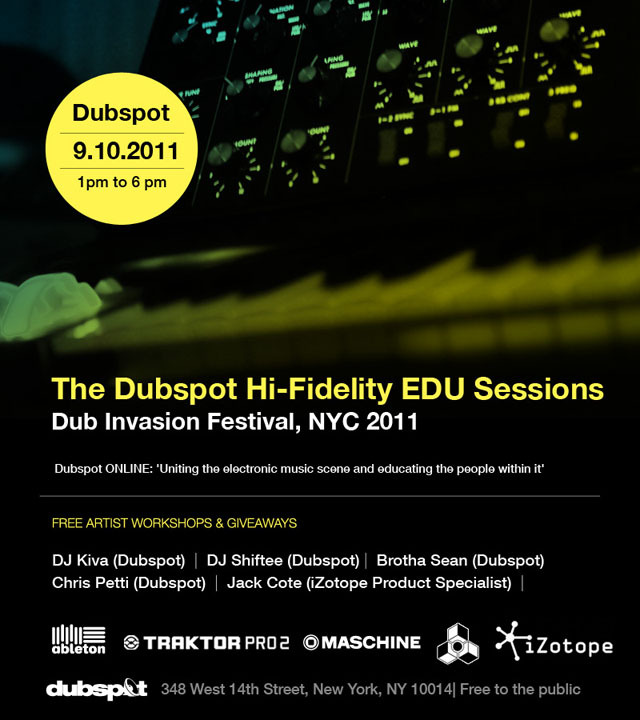 On Saturday, September 10th, from 1-6pm, Dubspot will host The High Fidelity EDU Sessions: a series of demonstrations, workshops, photo exhibitions, film screenings, and presentations from some of the most esteemed music technology creators, artists, instructors and manufacturers. This unique event will include presentations from Ableton, iZotope, Native Instruments and Propellerhead. We will also be giving away a copy of Traktor Scratch Pro 2. This event comes in conjunction with the Dub Invasion Festival, a two-week, Dubspot sponsored event in it’s inaugural year; featuring many performances by legendary artists at some of New York’s premier music venues, as well as workshops with the legendary Mad Professor on September 16th and live dub pioneer, Adrian Sherwood on September 8th. Please have a look at the full schedule of events at Dubspot during the festival below. DJ Kiva (Production) – 3-3:45 PM: Dubspot instructor DJ Kiva presents some beginning and advanced production techniques using Ableton Live 8. DJ Kiva (Production) – 5-5:45 PM: DJ Kiva demonstrates live dub techniques using Ableton Live & the Akai APC40. JUST ADDED: Raz Mesinai a.k.a. Badawi (Production) – 4-5 PM: Composer, producer and Dubspot instructor, Raz Mesinai is one of the pioneers of the NY school of experimental dub music in the early 90′s. DJ Shiftee (DJ/Performance) – 1-1:45 PM: Dubspot instructor and Native Instruments product specialist DJ Shiftee will give an overview of Traktor Scratch Pro 2, using Maschine and X1, with jaw-dropping demonstrations along the way. DJ Shiftee (Live Streaming DJ/Performance) – 2-2:45PM: Shiftee will do a second, live streaming demonstration. Dubspot presents a live streaming workshop with Dub pioneer Adrian Sherwood who will speak about his approach to production, remixing and performing live dub. If you can’t make the event, click on the above link, where you will find a live streaming video the day of the workshop. Adrian Sherwood, next to Mad Professor, may be one of London’s greatest dub and reggae champions. Forming the music collective Singer and Players in the 1980s alongside Mickey Dread and Prince Far I, Sherwood quickly became label head to a variety of label releasing dub and reggae, including Hitrun Records, Pressure Sounds, and Green Tea Records. Sherwood has produced for Sinead O’Connor, Skinny Puppy, Depeche Mode, and Coldcut, among others. Come through Dubspot during the day on Tuesday for a variety of seminal documentary screenings on the history of dub music. Dubspot presents a live streaming workshop with legendary Dub pioneer Mad Professor who will speak about his approach to production and his extensive history and relationship with Dub music. 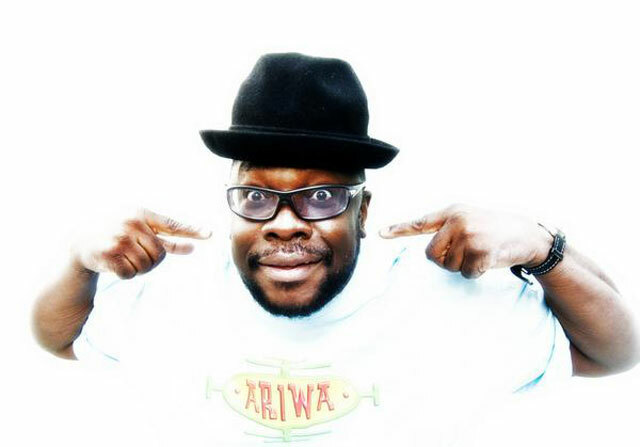 Mad Professor is one of the most widely respected and well known dub producers and engineers in the world. 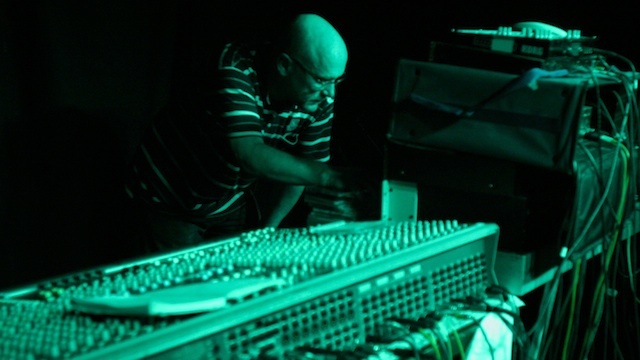 Known for bringing dub production and engineering techniques to London’s musical landscape at a time when dub was still emerging in the city, and long before it would transform everything from punk to electronic music. Mad Professor has produced records with Lee “Scratch” Perry, Sly and Robbie, Sade, The Orb, and Massive Attack. Is there any chance youll upload the videos so we can watch those sessions online?